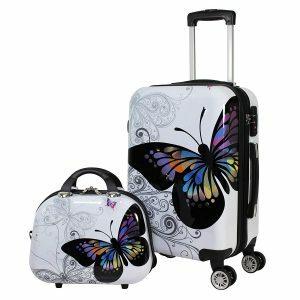 World Traveler Butterfly 24DM110-2 is a two-piece set of hardshell spinner suitcases- a cabin bag and a tote bag. The average score is 4.2 out of 5 stars by 116 customers at the time of this product review, with mostly positive comments. Both bags are robust and durable with a tough PC- polycarbonate shell exterior with nicely padded side grip and top handles. The three-digit combination lock is TSA approved and the TSA staff at the airport will unlock your bags without needing to break the locks. The 21-inch size cabin bag comes with eight spinner wheels that rotate 360 degrees and let you maneuver the bag easily even in small spaces. It has a push-button and self-locking solid telescoping handle that can be stored internally and lock at two points. The carry-on and the tote bag can both be expanded by up to 20 to 30 percent and you can fit in quite a bit in their ample interiors. The cabin bag has dual compartments with zipped pockets on the left and elastic cross tie-down straps- garment restraints on the right to keep your clothes in place during your journey. This 21” cabin bag weighs 6.4 pounds with the dimensions of 21H x 13L x 9W inches, and the 12” tote bag is 2 pounds and 12H x 13L x 8W inches. The tote bag fits inside the cabin bag as unexpanded and you shall receive it this way and that’s how you may store them when not in use. The fully lined interior in both bags are versatile and spacious with the garment restraints, zipped secure organizational pockets and accessory pockets. The unique butterfly emblazoned design with vivid colors makes them look quite cute. You can take the 21” cabin bag onto the plane on most domestic and overseas flights and carry the tote bag with the handles like a purse but not over your shoulder. You can easily fit the carry-on in the overhead bin above your seat and the tote bag under the seat in front of you. 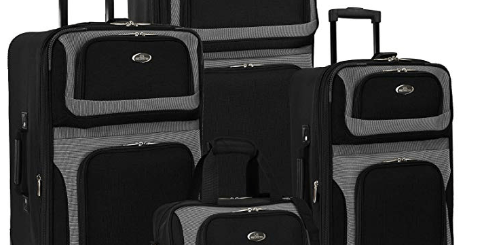 There is a thick elastic strap behind the tote that slips over the telescoping handle and keep it on the cabin bag and push or pull them together on the spinner wheels. The tote bag makes a great make up bag for ladies where they can put all their hair, skin and make-up products, hair dryers etc. These bags are built very sturdy and they will hold up very well over time unless exposed to constant rough treatment. The protective film on the bags help them to be protected from scratches, scuffs and marks. The company has a 30-day return policy if you encounter any problems. One of the customers recommended the use of a Mr Clean Magic Eraser to remove any scratches. The Butterfly Set bags look really nice and are reported to be even better in reality than photos and you’ll no doubt get many compliments. They are not expensive and the price seems right for their robust construction, strong zippers, versatility and functionality with different compartments, spacious interiors and expandability and beautiful design.